Keep your head down. Hide your face. A mask will draw attention, but bandages might work. Above all, never let them see your eyes. Those eyes will betray you in an instant. This is the advice Addison Goodheart receives from his mother. He’s a young man who lives in fear for his life: if people see his face, they will kill him, which means he’s forced to live a life in exile in the sewers below the city, venturing out only at night. Books are his only refuge from this grim reality: when he finds his way into the library, he meets Gwyneth, who, like him, is has to hide herself and cannot learn to trust. The bond that soon forms between these two lost souls runs deeper than the tragedies that have scarred their lives. Something more than chance − and nothing less than destiny − has brought them together in a world whose hour of reckoning is fast approaching. 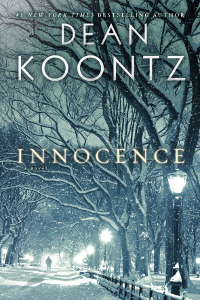 If you’re looking for another classic Dean Koontz horror-chiller, then Innocence will come as something of a surprise. This novel really is something special. Koontz turns his hand to a sensitive and thought-provoking tale of humanity, spirituality and redemption, which has left some readers reeling. He has told interviewers that this story just poured out of him and he enjoyed writing this novel more than any of his works that came before it. This may just be the book Dean Koontz was born to write. You can’t beat a book that stays with you long after you’ve put it down. A perfect cosy, curl-up read for a long winter – highly recommended. My name is Linsey and I love crime fiction. The rebel in me likes to see rules broken, and the mother in me feels a need to see order restored - perhaps it’s a Freudian thing. I love the dark introspection of Scandinavian crime fiction; the beauty and cruelty of the Italian giallo and a nice big slice of US hard-boiled psychological thriller. As soon as I decide where I’m going on holiday, I’ll find a fictional detective who lives there – yes, I want to see the sites, but I also want to read the underbelly. That’s what’s so great about crime fiction. I’m a freelance writer, based in Manchester England; a city with a few crime writers of its own. If you’re planning a holiday here, look up Cath Staincliffe, Val McDermid, Chris Simms, Bill Rogers and others. And if you need a writer, take a look at my website – but I’m not showing you my underbelly.